Creepers, Climbing plants and Vines all have their uses in the garden. Some require support, others will be self supporting, climbing by attaching themselves to other plants, trees walls and fences. Climbing Plants with colourful flowers can be a feature in the garden, they can also provide a degree of privacy or be used to cover up unsightly fences and buildings. Our Climbing plant section provides you with pictures, growing conditions, pruning and general care tips on a wide range of climbers. We allso tell you the best place to buy them, both online and locally. Different species of climbers are suited to grow in sun or shade and in the garden they are great adding some height. With a huge variety of plants and vines available to buy online we provide some pictures and ideas for using them in gardens of all styles. 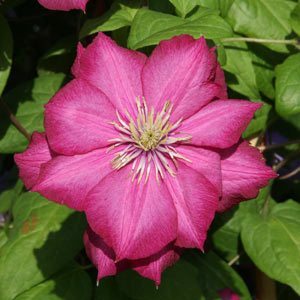 Clematis are a classic climber, and ‘Ville de lyon’ pictured right is no exception. Browse some of the most popular climbers listed below. Climbing plants are valued in the garden for a number of reasons. flowering climbing plants can add extra colour to the garden. Clematis and roses of course, but what about our Australian Native climbers, or some of the exotics like Lapageria rosea. at a dimension of height . Often lacking in gardens especially newer gardens, climber can add height fairly quickly. Allamanda or Golden trumpet vine – for tropical areas only. Other climbing plants on our list that are of interest are : Berberidopsis, Decumaria, Eccremocarpus, Hedera, Hydrangea Seemannii, Jasminum , Lapageria, Lonicera Passiflora, Pileostegia, Viburnoides, Solanum, Sollya, Trachelospermum, Birdwing Butterfly Vine, Native Grape, Native Lilac, False Sarsaparilla, Australian Wax Plant, Austral Indigo, Bower of Beauty.